Thinking of taking on the task of cleaning or installing grout on your own to save a little money? Think again. Taking on a grout project by yourself won’t save you any time or stress, and in fact, you might find that a poorly executed DIY project winds up costing you more in the long run! Tile regrouting and cleaning grout are jobs that require a certain level of expertise, and the professionals at The Grout Medic are highly trained in these delicate procedures. But, if you’re feeling confident in how to install grout or how to clean grout, avoid these five mistakes we see weekend warriors make when trying to complete their own grout services. You may be able to skip the research and preparation steps when taking on certain projects in life, but grout removal and installation isn’t one of them. Preparing your workspace before beginning the job is the most important step in tile regrouting project. If the grout isn’t removed enough or the grout isn’t mixed properly when installing, the grout won’t adhere correctly and you’ll be left with a huge mess. Fixing these mistakes can cost you more then what a professional like The Grout Medic would have charged you in the first place. Applying grout properly requires perfect timing. 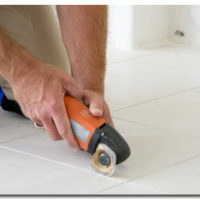 A common mistake of DIYers is applying and spreading too much grout at once. As soon as grout is laid, it starts to harden so you must move and shape it into place immediately. It’s also important that you clean the tile as you go, before it hardens, or you’ll have an impossible mess. The key is, don’t try to cover too much area in one application. Rather, grout small areas and finish completely before moving on. It’s a common mistake to use the wrong type of cleaners and not the right tools while cleaning the grout. All you need is a bucket, brush, grout cleaner, knee pads, towels and hard work, and time & stress. Too much water or wrong type of cleaner on tile floors weakens the adhesive underneath the tile and can cause grout to crumble over time. The same can happen if you use abrasive materials or scrub too hard during the cleaning process. If you’re not sure how to clean grout, put down the brush and call the experts at The Grout Medic. Because grout is a porous substance, it will absorb any liquid applied to it. Acidic or colored cleaning chemicals will cause long-term damage and discoloration. 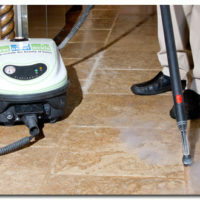 Acidic cleaners can also make grout more porous, causing it to collect dirt and grime even faster. 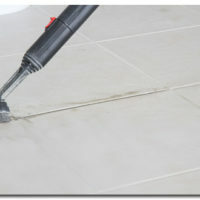 Instead of harsh chemicals, The Grout Medic uses a steam cleaning system that extracts dirt and grime from grout without damage, leaving it disinfected and clean. The best way to do DIY grout projects? Don’t! Instead, hire the professionals at The Grout Medic. Installing new grout and cleaning grout are projects that can do more harm than good when not completed properly. Trust The Grout Medic to treat your tiled surfaces with the care and expertise they deserve. Call us at 1-866-994-7688 for a free grout cleaning or tile regrouting estimate today!